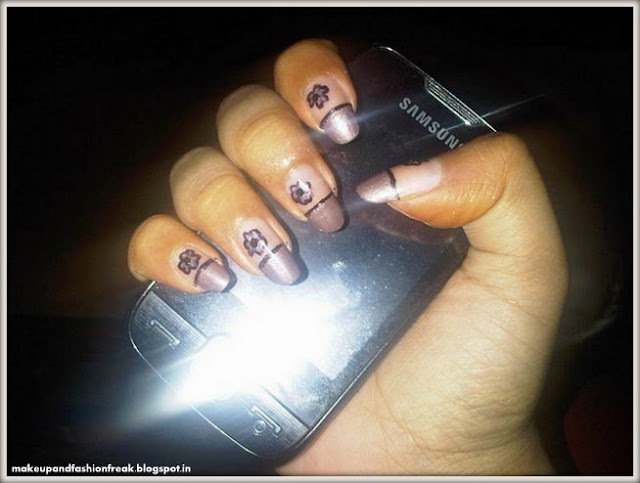 Makeup And Fashion Freak: MY FIRST NAIL ART.. I am back.. today, just doing nothing, I tried doing a nail art and I think it came out pretty nice!! so thought of sharing it with you guys hope u like it!! I'll do the tutorial if you guys like it..
very pretty. I am sure this requires a very steady hand!! its beautiful ..doesn't sketch pen gets removed..? That turned out really well!! specially for your first time! Amazing! lovely nail art, how do you get it soo thin ? don't sketch pens fade away ? hi smita, ty for the like wil do the tut soon k and i outlined wid the marker and then wid the nail polish dear..